At times when i hear something good from others, i think it is great to publish it here on the blog. This testimony comes from Rory Moore, the author of “The Tithe That Binds”. His website is called, Prepare His Way. I have Rory’s book in my office and on my “to do” list, but here is a quote that i recently read from him. Thought he said some powerful things about Christian stewardship. “As a former leader, assistant pastor, board member, I am all too familiar with the disregard and disrespect aimed at the “non-committed” brethren. Too many times we saw people of success, business people, well-salaried people catered to, favored, and sought after for their membership and support. We had one man who did especially well at offering time who was “gifted and anointed” to take up the weekly collection. We listened as pastors discussed the success or failure of the Sunday show and income at the mid-week staff meeting. We saw and participated in leaders banquets, church-bought meals after service, and the entertaining of visiting ministers. We saw the poor and down-trodden ignored and disdained. We saw them shuffled off to a benevolent fund minister or the food pantry minister. We saw pastors family eat out virtually every day at least once and sometimes 3x a day. We saw as people tithed big and who could care less about meeting the needs of the needy. They were well-trained to feed the offering plate rather than their brethren. We saw the unpaid laborers of the church work and scramble to fundraise, sell all sorts of stuff to support the “ministry” of our church. The bigger the seed, the greater the harvest. The only ones getting rich are the wealthy huckesters who pocket your money. It’s great to see someone else break the shackles of the babylonian church system. I agree that giving should be to support those needy, homeless or to misisonaries who have given up everything to share Christ’s love. 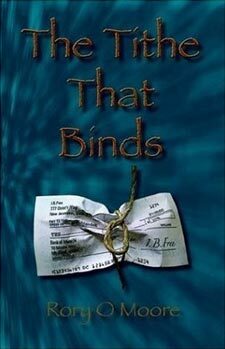 The law of tithing binds and blinds. The Christian community needs to wake up to liberate the body of Christ from these money hungry, mammon loving preachers. I personally think there is a greater threat than the “tithe” and it comes from Christian universities with the Emerging Church movement that does teach good works, I haven’t really heard a liberal in these setting support a tithe, but they do support homosexual unions or at least avoid the subject altogether so as to avoid having offend anyone. I think there are some preachers who are playing the politic game, and God is the only politician who should have any say. Christendom is not a democracy, but why does everyone treat their leadership that way even if they are the greatest and best preachers? There needs to be some law to doctrine that does binds but does not blind. The idea of tithe and free will giving is fairly clear, but it is not in my top ten priorities in dealing with those in the Church. Stephen, you could really see the influence of the emerging church in the 2008 election. I never heard so many so called believers come out and say they were tired of Christianity being viewed as anti-gay and anti-abortion. So many young people voted based on the voice of tolerance rather than what’s right…..not that there was a “right” decision to make in that election anyway. I just couldn’t believe the backlash I was hearing. 1. against homosexuality.—civil marriages, child adoption, school curriculum endoctrination. 2. Pro-life–against abortion, against embryonic stem cell research, against doctor assisted suicide. 3. Against teaching evolution without comparing other theories like intelligent design. 5. Against the feminist movement–calling God a “she,” changing gender specific Greek works into gender neutral in Scriptural translations. Perhaps if I went further, the “tithing” would be near the 11th to 20th example. I am sure there are more fish to fry, I can accept the brother who tithes as a genuine Christian over those who in the above examples and catagories deny Christ’s divinity, affirm homosexuality, abortion, and the radical feminists and the athiestic scientific mumbo jumbo. The biggest battleground that Christians have to take back is the universities that we created. I recall one person who calling Seminary as “cemetary” because they literally kill the Spirit of God with the radical teachings. When Pope Benedict, as Cardinal Ratzinger, sent a letter to American Catholic universities to ship shape and teach Catholicism accurately, it was not something to be negotiated and watered down. I am glad, Steward, that you see what I mean.